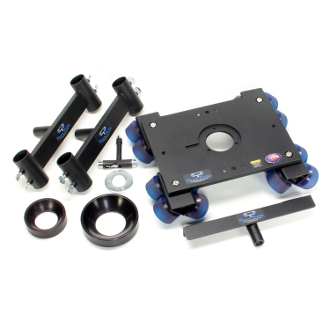 This kit is the same as the "Original" Dana Dolly Kit, however with a 150mm and 100mm ball adapter instead of the 75mm and 100mm ball adapters, and includes the center support for heavier cameras. Includes: Dana Dolly, 2-"Original" Style Track Ends, 1-100mm Ball Adapter, 1-150mm Ball Adapter, Center Support, Washer, Tool. Black. Made in USA.